Expecting a tax refund this year? That’s great news! No matter how small or big your efiling tax refund is, you should put it towards reaching your financial goals this year. 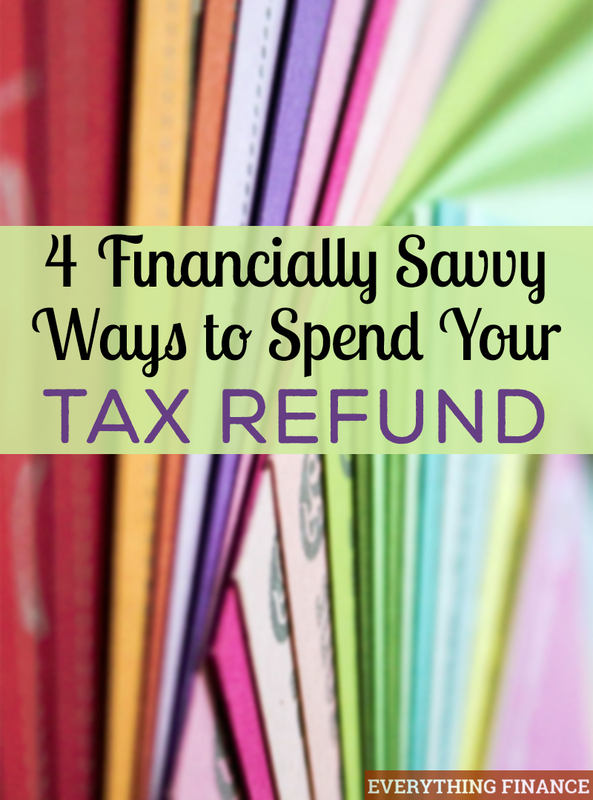 It can be tempting to blow your refund as “fun money”, but here are a few financially savvy ways to spend your tax refund instead. If you don’t have an emergency fund, then now is the time to start one. For those that don’t have any type of emergency fund, $1,000 is a great place to start. This is what Dave Ramsey tells everyone to do before getting out of debt. Having $1,000 saved for emergencies helps you breathe a little bit easier, especially if you’re living paycheck to paycheck. Already have $1,000 in your emergency fund? Great! Your next goal should be to save 3 months of living expenses. Let’s be honest. Putting your huge refund check towards debt isn’t fun. It’s way more fun to splurge on a trip or shopping spree. However, finally tackling a debt that has been hanging over your head can help you out. Paying the minimum payment on a $3,000 credit card bill may seem like no big deal, but the interest and payments are stealing away money from your monthly paycheck. Assess your refund and see if there are any debts that you can pay off once and for all. If not, then you can also try splitting up your refund so that 20-40% of it goes to debt repayment, while the rest is used for savings and fun. Now may be the time to update or do some maintenance on your home. Money spent now to upgrade air conditioning units, old furnaces, and roof top services for outdated/damaged/leaky roofs can save you money in the long run. Even just switching to energy efficient light bulbs and other small jobs to make your home more energy efficient will show up as savings throughout the year. Success expert Brian Tracy says, “Here is a rule that will guarantee your success – and possibly make you rich: Invest 3% of your income back into yourself.” His philosophy is that if you regularly invest in yourself and your career, you’ll easily earn more money. Getting your big refund check is exciting, and it’s tempting to treat yourself after a year of hard work. However, it’s financially wise to build up your savings or retirement, invest in yourself, or pay off debt to put you in a more financially stable position. If you still feel the need to treat yourself, don’t be afraid to allow yourself a small percentage of your refund as “fun money”, while the rest of your refund goes to something financially savvy. How are you planning on spending your tax refund?